Our newest beneficiary is Sylvia. We sat down with Sylvia to talk about her background. Here is what she had to say. ASSET: Tell me about your family and upbringing. Sylvia: I come from a polygamous family and I have three brothers and five sisters. My parents divorced when I was a baby and my father married another wife who bore him two boys and two girls. When my father deserted my mother, she had five children comprising one boy, my oldest brother, and 4 girls, me being the youngest among the five. My mother had a job in a textile factory where she earned the money to pay school fees for my sisters and I. My father owned a butchery but he was only willing to pay tuition for the boys claiming that girls were supposed to stay at home waiting to be married off. Unfortunately my father died when our oldest brother was in senior-four. My mother struggled to get money to send him to an institute were he could study plumbing. With her job she was also able to keep my sisters plus me in school, though it was not easy because we were always being chased away from school for lack of school fees. Her salary was small and the responsibility of running a home without the help of our dad was big. She worked harder and managed to get some private people she would sew for at home after work. However she started getting constant headaches and one time it got so intense that she could not even understand what she was doing. The doctor said she had got a mental problem due too much stress, depression and not getting enough sleep. He gave her some drugs, which had some side effects in that it would make her so weak. With these complications she was forced to leave her job and hasn’t worked up to now. It is a slow recovery and we are hoping that she gets back to being herself because once she stops her medication she becomes ill again and goes out of control. My older brother had not yet got a job but used to do odd jobs to get us food and meet mum’s medication bills since the situation at home was so bad and mum I was not in position to meet their school dues, my 3 big sisters quit school one after the other and got married. currently they are housewives except for one whose husband set up a hair saloon for. I am currently staying with my mother plus her two grand children. ASSET: How far have you gone in your education? Sylvia: I completed my Advanced Level degree in 2008 and was admitted in Makerere University where I am pursuing a degree in computer science. Although I attend lectures, I am not officially registered because I have not cleared tuition, which is an essential if you are to register and be considered a legal university student. Sylvia: My mother’s health status; due to the fact that my mother can not work because of her mental problems it is impossible for her to get money to keep me in school. My elder brother who is the family’s bread earner gets a small pay and considering that he has a family of his own now he is not in position to provide for both families and pay for my tuition too. I got a job that I am doing right now in a stationary shop during day since I study in the evening because I had got some computer skills from my secondary school but the salary I get is what I use for transport to and from the university plus meeting my basic needs like buying university hand outs, printing my course work etc. ASSET: Describe your educational goals. 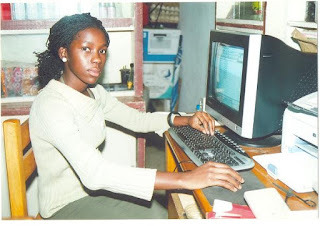 Sylvia: I want to attain a degree in computer science after which I plan to master in hardware and software development, I also plan to go for a short course in networking (cisco), web designing and counseling. ASSET: Describe your career goals. Sylvia: Considering the fact that we are in a technology era where technology works almost everywhere I also want to play a part in the technology development. I plan to attain this after I have graduated and in position to work as data base administrator and designer, who manages data, designing data base for large organizations. ASSET: How do you think this scholarship will help you achieve these goals? Sylvia: If am helped to attain a degree I will make sure I work so hard to attain excellent results that can get me a government scholarship for a master’s degree or I can get a good job with a good pay so that I am in position to sponsor myself for a master’s degree in computer science and also be able sponsor myself for the short courses I that want to pursue. ASSET: Why do you think you are a good candidate for an ASSET scholarship? Sylvia: I think am a good candidate because I have a strong passion for education, I have defined goals which I have worked so hard from the past to achieve, am a hard working young lady who knows how to prioritize my wants and is willing to give the best in my studies and am also a kind person if helped I will be more than ready to do the same for the many people who are going through similar situations like mine, I will be in position to get counseling materials like encouraging books that would help in my counseling sessions and by so doing become a useful person not only to my family but to the entire community . ASSET: What other financial support do you receive for your studies? Sylvia: I receive some financial help from my elder brother plus the monthly salary of 60,000/= that I get from my job. ASSET: Describe a challenge that you have faced in the past and what you did to overcome it. I went and talked to my headmaster who gave me a small piece of land at the school farm so after classes and during holidays I would dig vegetables like carrots and cabbage and egg plant which the school could buy from me and prepare for students’ meals in this way I got some money which brother could top up on and in that way I managed to complete the two years of my advanced level. ASSET: What are your interests? What do you do in your free time? Sylvia: I like counseling, volunteering, reading inspirational books, singing, interacting with people and playing netball.I am only free during weekends and during that time I attend bible lessons, I also volunteer as a youth counselor and sing in the choir at church.